Respite Parenting – providing a safe environment for kids to grow, learn and explore! Last night I was craving a peanut butter sandwich. Peanut butter is my comfort food. I had the peanut butter, and the grape jelly but bread was green. Then I remembered the box of Cheerios that I bought the other day on impulse. I haven’t bought Cheerios since Izzy was little. 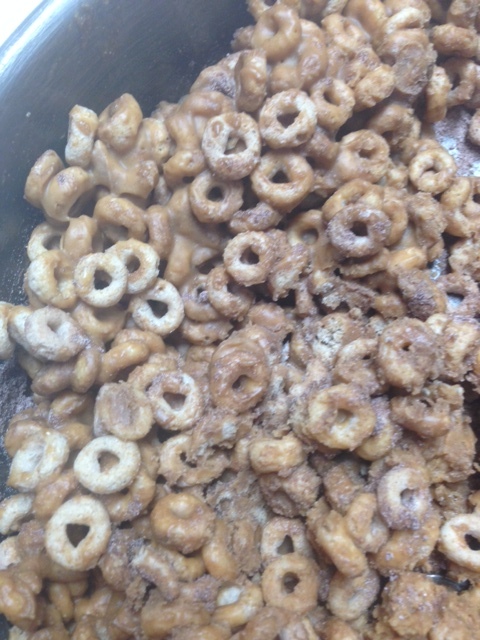 I sprayed down a container with cooking spray and poured roughly two cups worth of Cheerios in the container. I combined 3 tablespoons of butter and 1/2 cup of peanut butter in a bowl and melted them in the microwave for 1 minute. I put 2 tablespoons of hot cocoa mix over the cheerios then poured the melted peanut butter over the cheerios and stirred it up. Peanut butter craving satisfied and my love of Cheerios renewed.